The People's Bank of China (PBC), the country's central bank, announced last month the creation of the central bank bills swap (CBS) aimed at supporting commercial lenders' perpetual bond sales. Primary dealers on the open market can swap perpetual bonds issued by qualified banks with central bank bills. Perpetual bonds with AA ratings and above can be used as collateral for medium-term, targeted, and standing lending facilities, and re-lending purposes. CBS and the quantitative easing (QE) adopted by the Federal Reserve amid the 2008 financial crisis may appear similar. 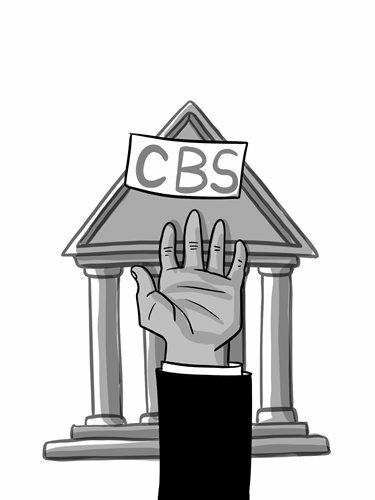 Some have called the CBS the Chinese version of QE even though they are different. In the US, QE refers to the Fed directly purchasing bonds and mortgage-backed securities (MBS), adding liquidity to the market. The Fed's portfolio expanded to $4.5 trillion from less than $900 billion before the 2008 financial crisis. The underlying difference between CBS and QE is risk. The CBS roll-out is aimed at helping banks issue perpetual bonds to meet the asset adequacy requirement from the Basel Committee's global bank assessment. The Chinese central bank does not shoulder perpetual bond credit risks, in clear contrast with the Fed whose methods include such risk-taking actions like purchasing "toxic assets" to bail out banks. A more significant difference between CBS and QE lies in the process of the "bills swap," which does not increase the monetary base of the central bank. Swapping central bank bills with perpetual bonds will not directly inject liquidity into the market. This current issuance of central bank bills is not similar to when the PBC bought foreign exchange to avoid yuan appreciation. Previously, the bank bill was issued to reduce, rather than unleash liquidity as purchasing foreign exchange would have an impact. Today, the CBS does not affect the monetary base, thus proving it is not QE. Though primary dealers may use central bank bills as collateral for a medium lending facility (MLF) or a standing lending facility (SLF) to gain liquidity, it would still be an indirect operation. Dealers will be expected to pay interest and there are due dates to consider for MLF, SLF, and the like. The Fed, however, bought Treasury bonds and MBS directly from the market to lower long-term interest rates and encourage banks to grant loans. Even after the Fed began rolling back the balance sheet, its total assets dropped to just around $4 trillion from $4.5 trillion in more than four years. The amount removed out of the balance sheet is tiny compared with the more than $3 trillion in assets added to the Fed's balance sheet from the 2008 financial crisis. Purchased assets acquired through QE will probably stay on the account, while perpetual bonds swapped are due after three years, and thus CBS doesn't expand the balance sheet of the PBC. The PBC toolkit still contains useful devices. Short-term interest rates hover at around 2.5 percent, well beyond the zero mark. So, a prudent and neutral monetary policy would be enough. It would be unnecessary to conduct QE operations similar to what the Fed and European Central Bank did during the 2008 financial crisis when it was their last resort. Although the monetary policies are useful, they remain limited and require fiscal plans to accompany them. As fiscal policy is expected to play a more significant role in the future, the 3 percent deficit of the Maastricht economic criterion does not apply in Chinese situations. It is entirely possible for China to raise its fiscal deficit and lower corporate tax rates. The fiscal deficit can be lifted to around 4 percent since the central government debt structure is healthy. First, China's government debt is mainly internal rather than external. Second, the percentage of short-term debt is comparatively low. Third, the Chinese economy and government revenue continue to enjoy significant growth, much faster than that of developed countries. The regulatory policies should also complement the monetary policies. The PBC has made great efforts to unclog the monetary policy system. In general, a modern banking system creates savings when issuing loans and generates money through the lending process. Meanwhile, the conditions and rules for issuing loans are the responsibility of a regulatory body. Off-balance sheet financing and shadow banking and the like are regulated as well. The PBC alone cannot finish the entire monetary transmission process. Given today's circumstances, it will take longer before a stimulus could affect the real economy. Due to the expectations of a global economic downturn and other factors including strict regulations, deleveraging, and cracking down on the shadow banking sector, the Chinese economy is likely to experience prolonged periods of pressure. With a proactive fiscal and prudent monetary policy in place, among other complementary measures, market confidence will be restored. The Chinese economy would begin stabilizing during the second quarter of 2019.